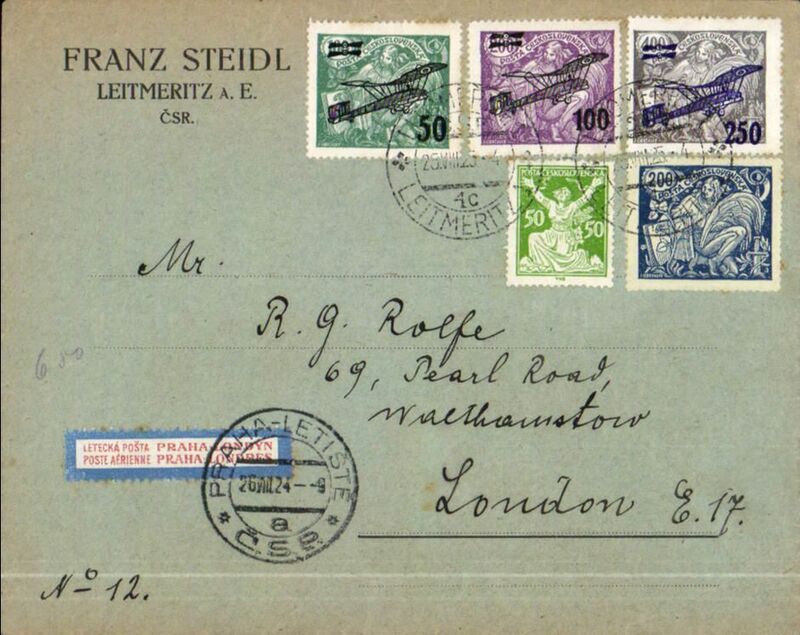 Early Cie Franco-Roumaine de Navigation Aerienne, Prague to London, no arrival ds, Steidl commercial corner cover franked 1922 air surcharge set of 3 on cover (+additional 250H ordinary stamps) , orange red/grey blue/white etiquette CSR-A-1, rated a great rarity by Mair.Early item in superb condition, and tied by 'Praha-Lettiste/26 VIII 24/CSP' cds. Nice item. 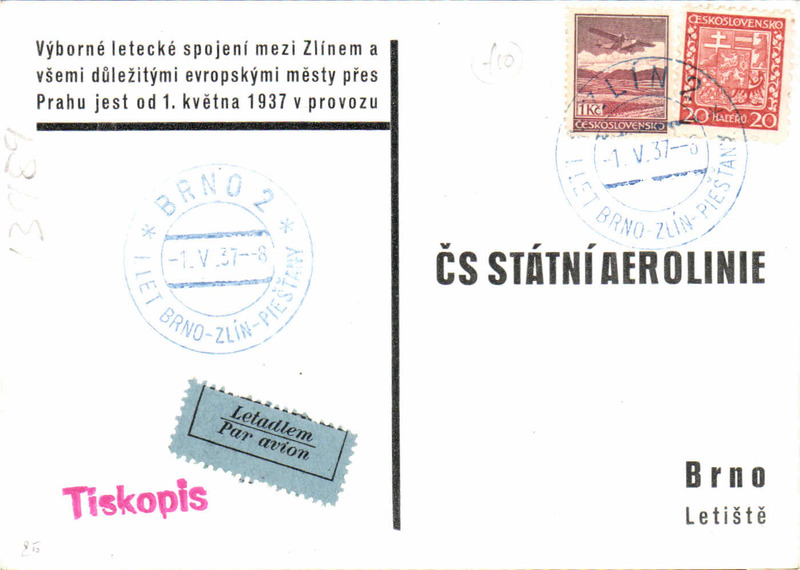 Czechoslovakia State Airline, reply paid 1.50k PSC, Franzensbad to Budapest, and return 29/7 via Prague, additonal 50kx2 Czechoslovakia and 16f Hungary stamps and airmail etiquettes. See scan. 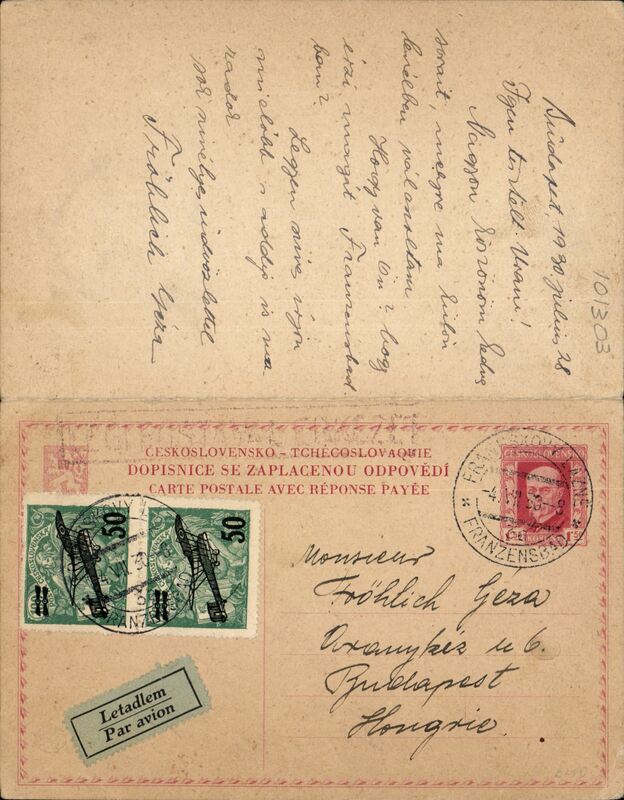 Aeropostale, rare acceptance cover from Czechoslovakia, commercial cover postmarked Asch (Czechoslovakia) July 31, 1930 with transit b/s Toulouse August 9th and arrival b/s Buenos Aires (Argentina) August 20th. 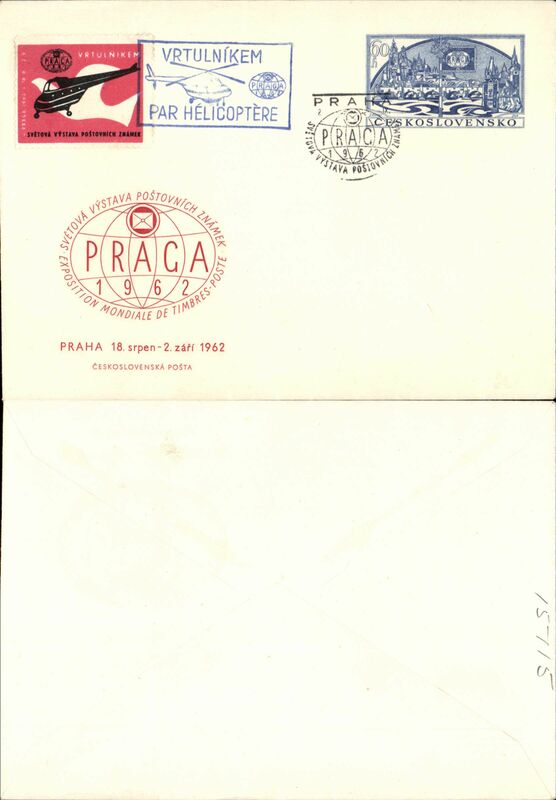 Czech airmail label. A few stains verso. 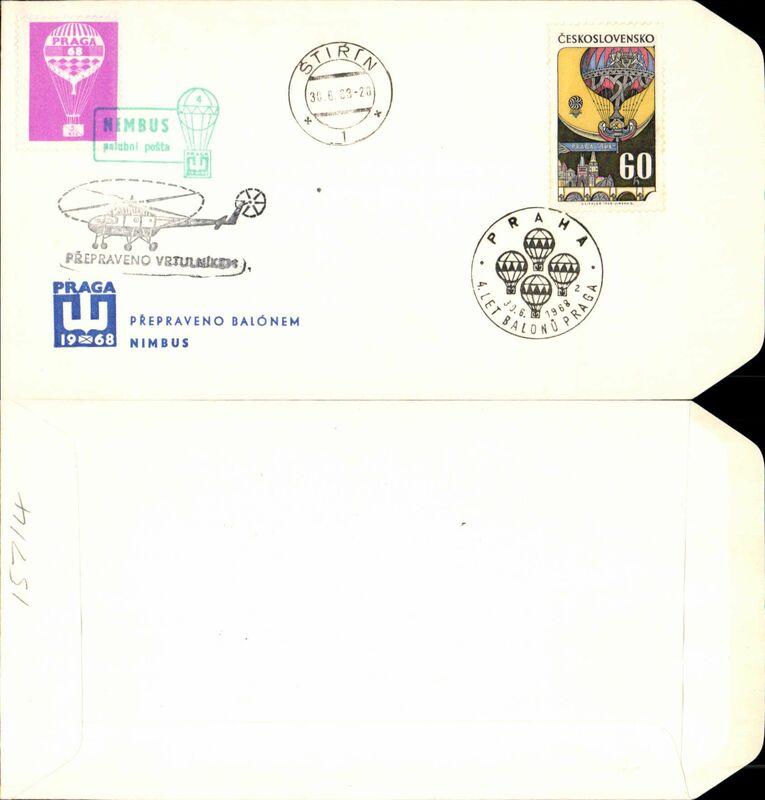 Czechoslovak/DLH, early airmail cover Prague to Zurich, 'Flugplatz/3.VII.31/Lufpost' arrival ds on front, 'Ukraina' logo corner cover franked 4k air, canc Prague cds. 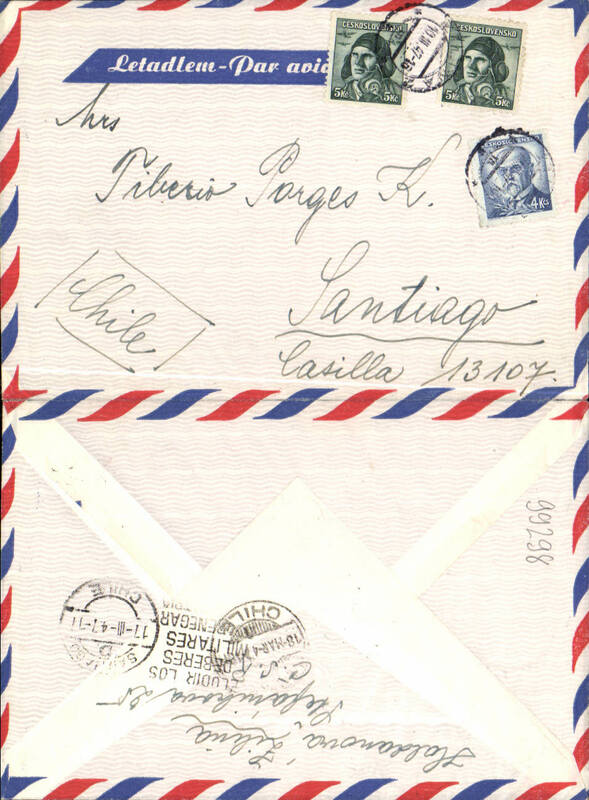 Early C.G.Aeropostale flown cover to Argentina, bs Buenos Aires 17/10, registered (label) airmail cover franked 19K, canc Jablonec cds, red 'Par Avion' hs, pale blue/black airmail etiquette, black '579' in circle BA postal district hs. Uncommon origin/destination combination. 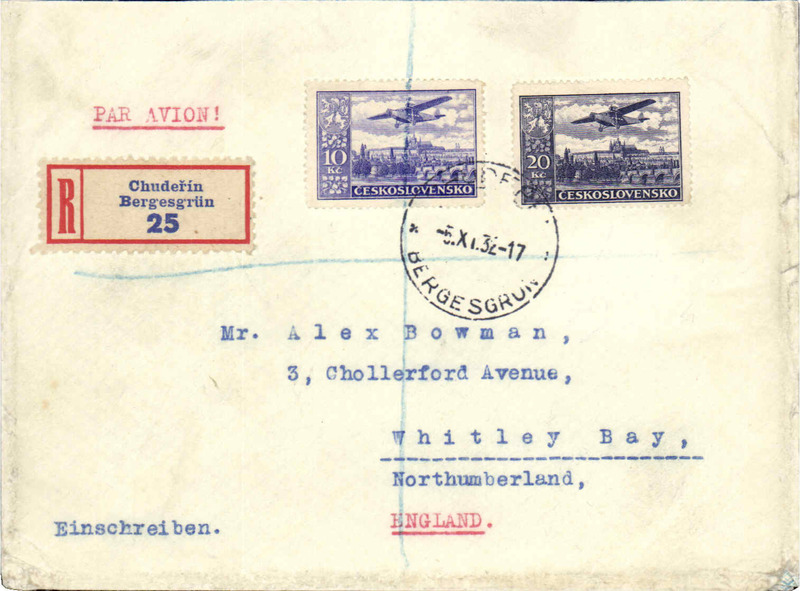 Bergesgrun to England, bs 8/11, early registered (label) cover, franked 30K, white/blue Par Avion etiquette. 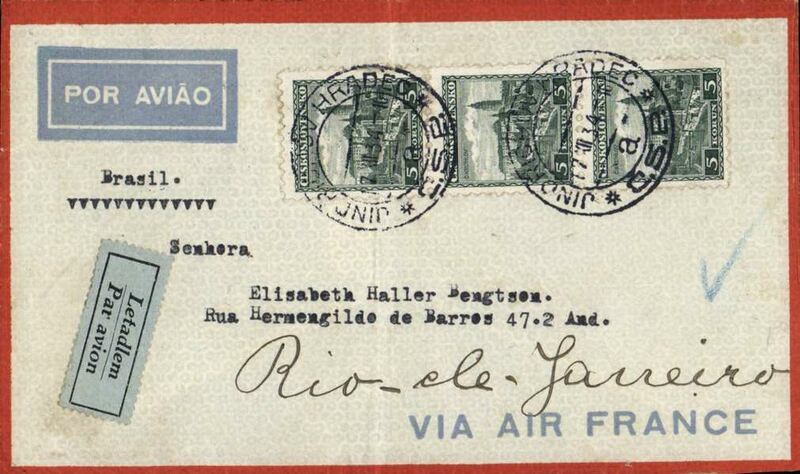 Prague to Dar es Salaam, bs 30/8, plain cover franked 1930 4K air, 2.50K, canc Grulich cds, via Prague 16/8 and Athens 25/8, black/pale blue airmail etiquette, ms 'Luftpost', carried by surface from Prague to Athens, then to Dar es Salaam, either by Imperial Airways to Nairobi and onward by Wilson Airways, or IAW to Dodoma and rail to final destination. Small, non invasive top edge nibble, otherwise fine. Interesting. 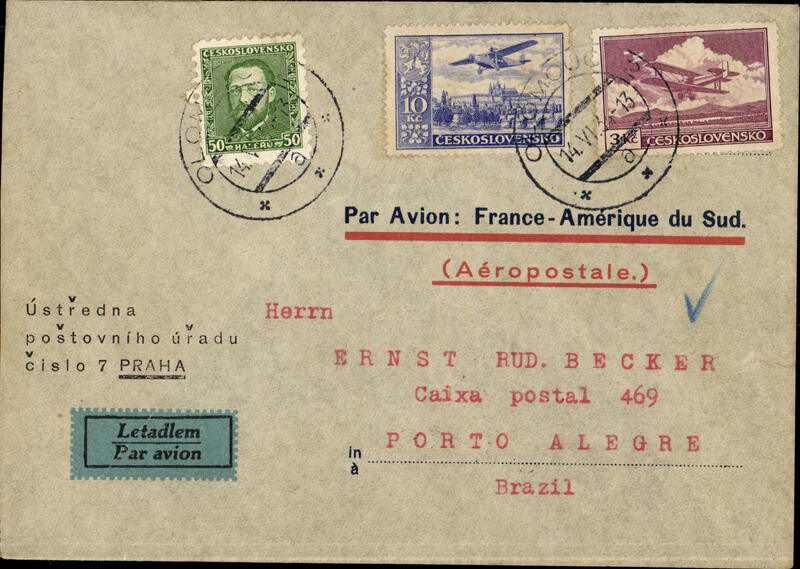 Air France South Atlantic service, Czechoslovakia to Brazil, Jindrich ur Hradec to Rio de Janero, bs 29/12, orange/grey Air France envelope franked 5k x3, pale bluie/black airmail etiquette. Ceskoslovenske Letecka Spolecnost (CSA), F/F Zlin-Brno, arrival ds on front, souvenir PPC showing one day connections from zlin. 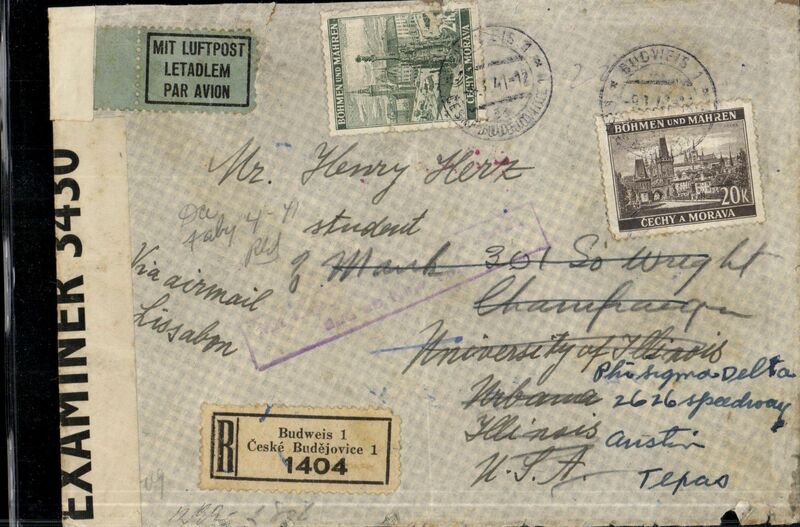 WWII dual censored trans Atlantic registered (label) airmail cover, Budweis to Texas, USA, bs 7/2, via Frankfurt, New York 13/1, airmail etiquette cover franked 22K, partial strike violet framed "Mit Luftpost nach Nor Amerika und ab New York" cachet, ms 'Via Airmail .. Lissabon', purple on brown OKW censor tape tied by German winged eagle censor mark, also sealed by B&W OBE 3430 British Caribbean censor. Carried DLH, then Pan Am Southern route via Lisbon to New York. 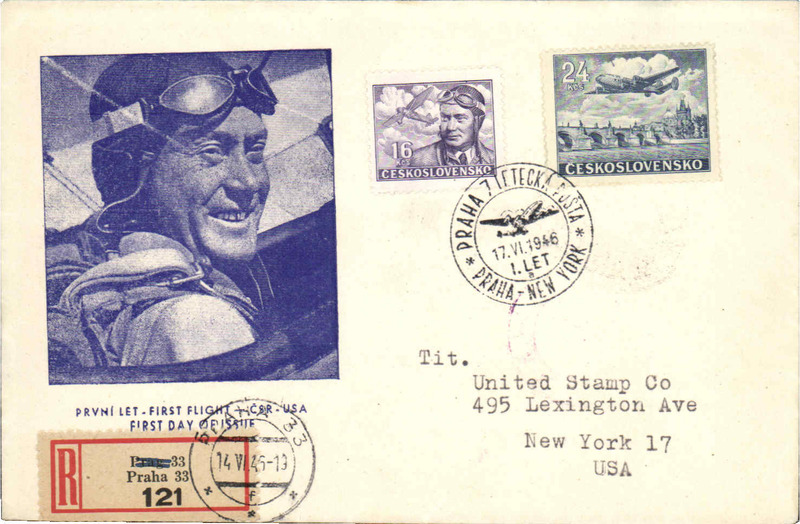 F/F FAM 18 Prague to New York, cachet ds, b/s, illustrated souvenir cover with picture of pilot. 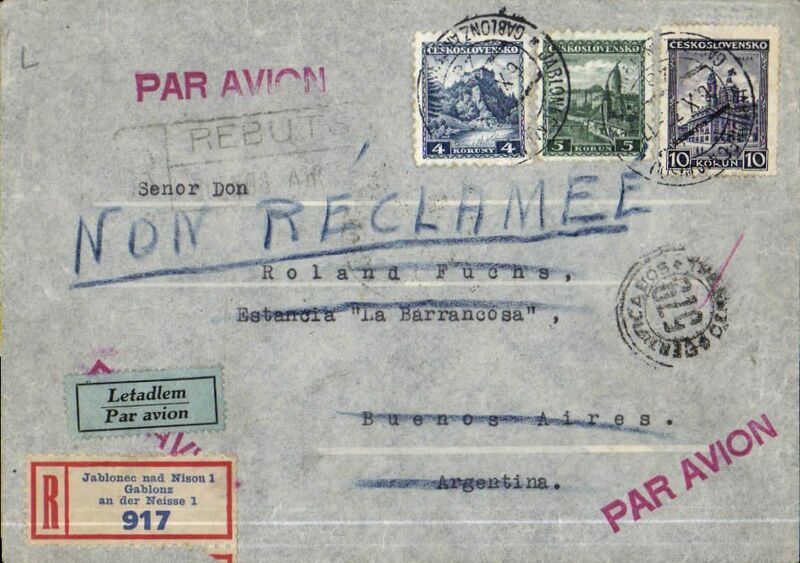 BEA/BSAA, scarce BSAA eastbound airmail airmail, Zilina to Santiago, bs 17/3, airmail cover franked 14Kc, verso bilinual hs "Dodging miitary service is deserting one's country". The transit time of 7 days could only be achieved by a joint BEA/BSAA timetable. PRAGA Expo special helicopter flight, special depart ds, cachet and vignette tied by Expo hs, souvenir Expo PPC. Balloon, special flight, Prague-Stirin, arrival ds, special vignette tied by special balloon cachet, also black helicopter cachet, souvenir cover.